Please take 1 minute of your time to get Steem listed here. 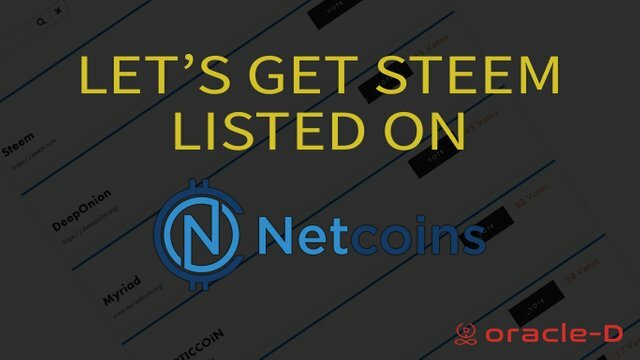 Netcoins is running a competition to allow one altcoin to be listed for free on their platform. We at @oracle-d support initiatives that get Steem out there in the marketplace, as this helps towards increasing the popularity of the Steem token. This is good for business, and helps us to attract new investors into the ecosystem. For 7 days, anyone can nominate and vote for their favourite coin to be listed. Steem has already now been nominated, so all you really need to do is vote now. Take another screenshot showing you've voted (it should say "you can vote again in xxxx hours") this is your AFTER screenshot. @oracle-d will support this initiative with upvotes. Best of all, you can do this all week. Every day you can vote again!!! This is a great way for us to show what our community can do. We have the biggest active community anywhere, and we should be able to make this happen easily. I mean, we have about 60,000 daily active users!!! So please, take 1 minute of your time to do this, for yourself and the whole blockchain community right now! 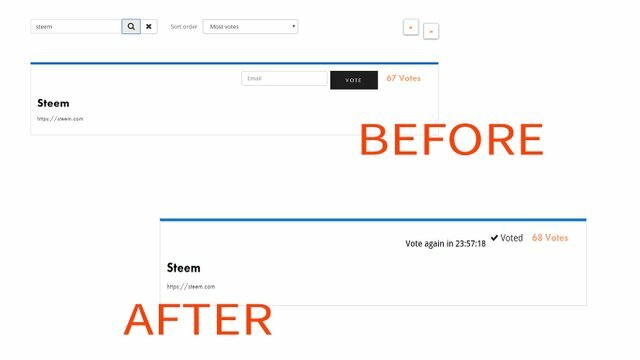 Done to vote steem for today. Waiting for the next 23 hours.